As a follow-up to my first post on black and white photography, I wanted to write about the selection process for choosing photographs to develop in black and white. In the past, black and white photography was the only option. Today, when digital cameras easily capture full-color images with no additional effort on the part of the photographer, black and white photography may seem like an old technology. But some of the most dramatic and compelling photographs made today are black and whites. Why? The absence of color requires the photographer to express emotion and tell a story in a different way. Creativity is forced from the artist, or the result is a bad photograph. In the end, the black and white photograph benefits from this extra creativity, and it is a much stronger image. We now have a choice in whether we make a color or black and white photograph. We choose to make a black and white because of the drama it conveys. But when deciding to make a black and white photograph instead of color, what drives that decision? 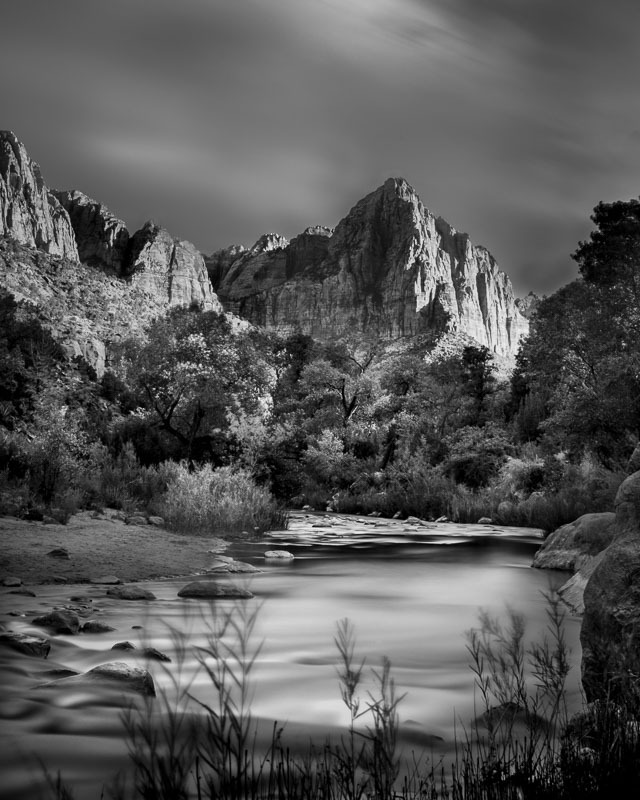 How do we select a particular photograph to be black and white? As I mentioned in my earlier blog article, the selection process should not be something like the following: "The colors in this photograph aren't that good because the light was bad. I'll just make it a black and white." Wrong--if the light was bad, it's a bad photograph. Period. It shouldn’t be a color or black and white photograph. I am primarily a color photographer, so when I have an image with beautiful color, I want to create a fine art color photograph with it. So the starting point for my process is usually to evaluate the color. If I can't make a good color photograph, then I will consider whether it will make a good black and white photograph. It's not an automatic decision, however, and 90% of the time, I wouldn't do anything with it at all. So if I look at a photograph and feel it’s a great subject and composition, and it communicates a simple, clear message, then if the color just wasn't there, I would likely consider converting it to black and white. When I am deciding whether to create a black and white version of a photograph, I also look at the elements in the frame to see if I think they will work in black and white. In general I prefer simple, graphic compositions without distractions. I think simplicity is even more important in black and white. I don’t think high frequency and random patterns look good in black and white. I prefer smoother, more gently changing shapes and patterns. An area of high frequency is one that has lots of small areas with different light levels. For example, the surface of a body of water has many small reflections. It’s like a disco ball of tiny bright and dark reflections. I avoid this pattern in black and white photographs. Black and white is about light and contrast. It’s difficult to establish a higher level of light and contrast when the effort is constantly interrupted and disturbed by these high frequency variations. 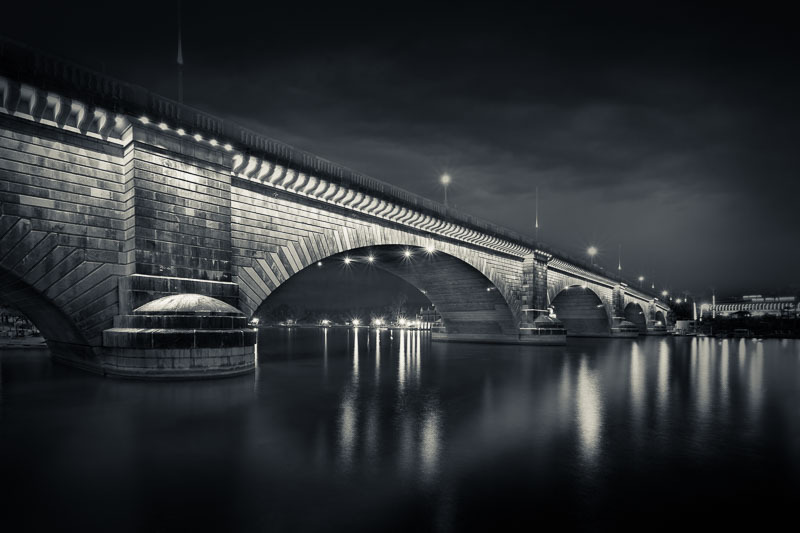 The photograph above of the London Bridge does include reflective water. But the water was very still to begin with, and by using a longer exposure I have eliminated any high frequency variations in the reflection. The reflection is more pure, and that simplicity makes it work in the black and white photograph. The same goes for the photograph of Mossy Cave Falls, directly above. Here the water is in motion and would normally appear very choppy with lots of high frequency variations. Again, I have made a longer exposure to smooth out those variations and simplify the photograph. Another deciding factor can sometimes be the subject matter itself. Particularly with older buildings, I sometimes like to make black and white photographs, because they help communicate the era of the buildings. 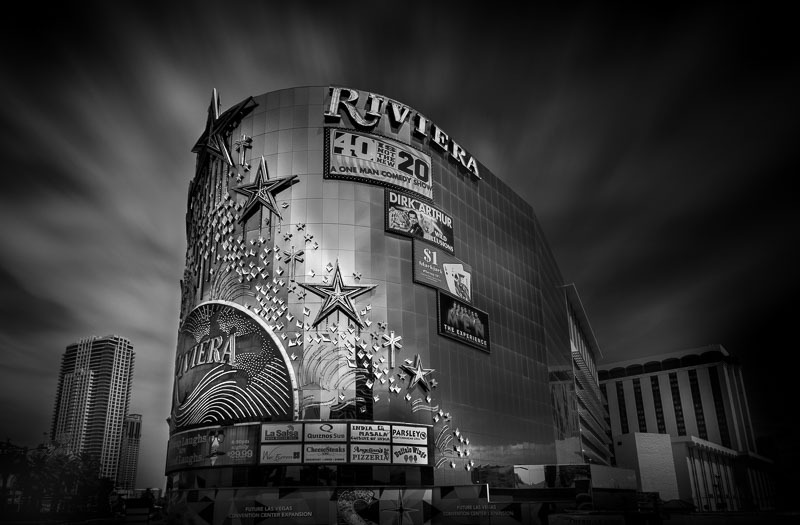 For example, these old Las Vegas hotels benefit from the black and white treatment. It helps tell their story and communicates the classic nature of the buildings. There are additional factors, but evaluating the color content and the graphical nature of the composition along with the subject matter are some of the primary ways I decide whether or not to make a black and white photograph.